If you’ve ever held gigs worth of content on your iPod or iPhone and lost the originals on your computer – you will love this app. You might know by now that if you connect your fully loaded iPod to your freshly wiped computer, iTunes will automatically want to erase everything on your mp3 player and start fresh. iTunes will also not allow you to transfer music or videos from your iPod back to your computer if you’ve erased the original file from your desktop. Pod to PC or Pod to Mac will let you do it all! The applications are built to allow you to transfer music and videos from your iPod or iPhone into your Mac or PC directly into iTunes. The applications use an interface similar to iTunes to view your iPod library, so you will not get lost. You can browse through your files, preview them and once you know which you want to transfer back to your computer click the “transfer tracks” button and you are done. The files will be automatically copied over back into our iTunes library. The software is also very useful when you want to plug your iPod or iPhone to somebody elses computer to charge or to play some of your files. Normally your Apple device would want to sync to their computer and would not allow you to play the content. 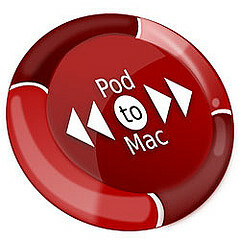 With Pod to Mac & Pod to PC your problem is solved. Both pieces of software are free, but still under beta so if you find any bugs, let the developers know. It’s not working on my mac also. I hope somebody could help to fix the issue. Can you download music from this site to your IPHONE or IPOD if not where can this be done?